If you want to be a Security Advisor then you will need to have an established career in the Security area previously to understand what is involved and what training you will need. A security advisor can work in many different areas such as: looking after the security of a building, looking after the security of a building site type area, looking after the security of a person etc. You will need to be confidential, confident and be able to work in a strict and demanding environment paying great attention to the person or building that you are meant to be keeping secure. If you are looking for an example cover letter to send with your job application, please see the below example which you can use. I would like to apply for the role of Security Advisor which you have got advertised in (which publication and when). 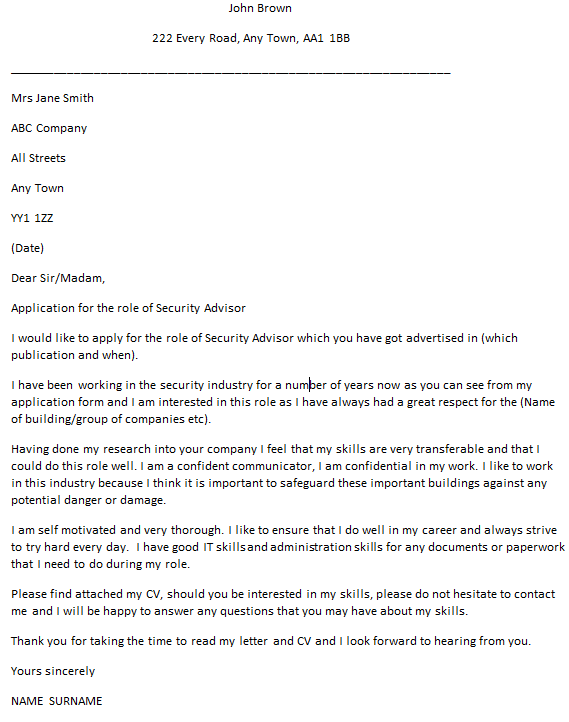 I have been working in the security industry for a number of years now as you can see from my application form and I am interested in this role as I have always had a great respect for the (Name of building/group of companies etc). Having done my research into your company I feel that my skills are very transferable and that I could do this role well. I am a confident communicator, I am confidential in my work. I like to work in this industry because I think it is important to safeguard these important buildings against any potential danger or damage. I am self motivated and very thorough. I like to ensure that I do well in my career and always strive to try hard every day. I have good IT skills and administration skills for any documents or paperwork that I need to do during my role. Please find attached my CV, should you be interested in my skills, please do not hesitate to contact me and I will be happy to answer any questions that you may have about my skills. Thank you for taking the time to read my letter and CV and I look forward to hearing from you.